Psychic Tips for Professional Readers | Dress for Success! The idea of Dress For Success really took off in the 1970s, with books telling both men and women what color to wear, how to accessorize, and for women how long the business suit skirt should be. Today, thank heaven, there’s a lot more leeway in how people dress for work in non-uniform settings, and never more so than in the psychic fair community. However, the other old saying — To make money you must look like you have money — is still very true. In order to be a successful Tarot reader, psychic medium or other intuitive on the circuit, you have to dress like you are already a success — and keep your audience/client base in mind. How you choose to present your metaphysical work will often clue you in on how to present yourself. People like the late Wayne Dyer like the comfortable look; Wayne wanted to present his material as accessible to everyone and easy to assimilate. Esther Hicks started out, when Jerry was alive, in a very preacher/schoolmarm outfit. Now that she is on her own, she is somewhat more flamboyant, but still wears something she could be seen in on the street. What she channels from Abraham is a higher-level thought and metaphysics package for people who are very dedicated students of Law of Attraction. On the other hand, there are still those who favor the gypsy look — long skirts, peasant blouses, bangles and bracelets, a head scarf and ankle boots, because that’s how they perceive themselves and their work. The one thing you will NOT see behind the table of a successful booth is Sloppy. Please — eschew the jeans, the rock t-shirts, the puffy/glitter decorated shirts or sweatshirts, the clothing that says you don’t take yourself (or your work) seriously. Remember that this is your first impression — and just as you’d put your best foot forward on a date (at least in my generation! ), this is a “first date” with the public. After many years, I’ve come up with what I call my signature look — and if you visit my little anime/chibi self above, that’s a perfect example. I want to come across to clients and audiences as relatively sleek/chic, with more of a flavor of Manhattan than California or Woodstock; therefore sequins, fringed long coats and batik/patchwork are right out. My go-to base is a set of black pants and a tank top from the Travelers Collection at Chico’s; it wears like iron and washes easily. While that might make me blend in anywhere, what pops my look is the coat that goes over the base — in the winter a burn-out velvet coat with long sleeves or a kimono made of washable brocade, usually in rich jewel tones. For summer, I found a wonderful McCall’s pattern that makes what are called “butterfly jackets,” and I have a half-dozen interchangeable ones. They are all very lightweight, in both solids and patterns. My “let’s impress the audience” summer jacket is made of silk sari material with a soft and subtle butterfly-and-flower motif. Everything here, with the exception of the velvets in the winter and the sari silk in summer, is easily thrown in the wash at the end of the weekend. Jewelry is usually one good statement piece — for me a necklace of high vibrational stones and crystals — and earrings. I finish the look with either closed-toe pumps or semi-dress sandals with a heel in summer, and ankle boots in the winter. If you’re going to look professional, don’t forget the details. Makeup? I never wear it. I’m sixty, and the last time I wore makeup other than for a photo shoot was my wedding. It’s simply my choice. If you are younger, or makeup has always been your thing then go ahead, but remember than in a setting like this, less is more. The lighting in large places is rather unforgiving and will show every mistake you make. And there you go. I have my look: unique, not outrageous, something I could still wear out to dinner comfortably, but definitely me. 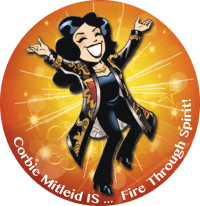 And after so many years, people know that if they see someone in a butterfly jacket or kimono, it’s more than likely Corbie — and they go looking for that at shows! When you decide on your look, make sure that it reflects who YOU are. Crystal Wind, a Certified Tarot Master, has a strong Egypt affinity and tends to wear caftans with Egyptian patterns. My wingsister, shaman and Medicine Woman Eagle Skyfire, wears clothing that is tailored but has a First Nations flair, either in pattern, cut or material. Canadian-based and internationally known “Rock Psychic,” Miki from Toronto, favors a Stevie Nicks flavor to her outfits. None of them would ever be mistaken for me — but they are not ever mistaken for anyone else, either. They have their look, and it emphasizes what they know, how long they’ve been in the business, and their surety in their craft. So have a wonderful time deciding how you want to present yourself. And once you have your look, really study yourself in the mirror — are you seeing a professional YOU would want to consult? Then your look is perfect!